I’ve said it before, but as you might have noticed in reading our bounty of wine-related blog posts, not many of them are from me. I went on Majestic’s free wine course last year to get a bit more clued up, and I’ve recently started doing wine tastings at home - just me, the chap, and a lot of glasses - for a monthly ‘Top Wine Picks’ piece; have you seen them? It forces me to do a bit of research about a particular wine, and gets me to really think about what I’m drinking, as opposed to just knocking it back alongside my dinner (not that I’d ever do that... honest). I guess I’m trying to get myself a bit more informed in the world of wine, because it’s a bloody minefield! And to be honest, I could be doing this for a lifetime, and still have no idea what that bottle of red you picked up from a random vineyard on holiday a few years ago will taste like. But still, where do you start?! It’s all well and good buying a bottle and reading the info on the back of the label (hands down, the best method when you’re desperately seeking a bottle in the supermarket), but how do you gain confidence in being able to differentiate your grapes? Well, as luck would have it, there’s a new drinks subscription service on the scene; Sip & Learn. 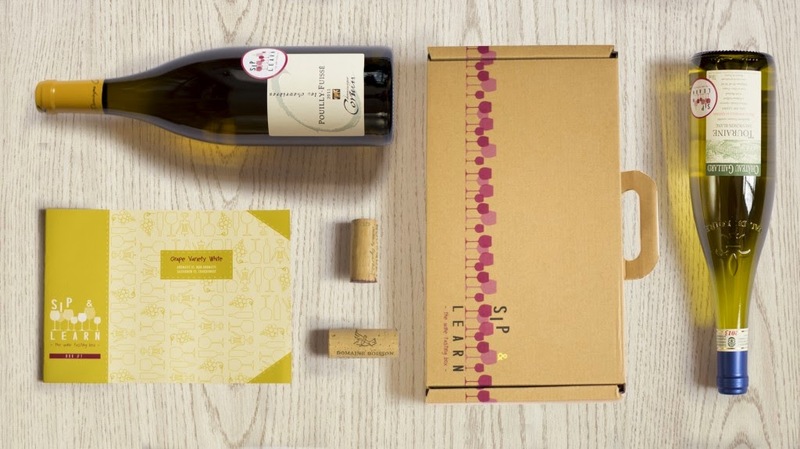 Sip & Learn’s goal is simple: to teach you about wine without boring you about it. They bring you great wines - delivered direct to your door - together with the knowledge of how to best appreciate them; you learn whilst you sip. So whether you want to do it to help you face the dreaded restaurant wine list, show off in front of your friends, be a bit more decisive at the shops, or even to impress a date, Sip & Learn’s home wine tasting programme is here to assist. The pair behind the box is Marie-Anne and Sylvain. Marie-Anne’s a big wine lover, but like me, she tends to panic when asked to taste or choose it. After years of bombarding her friend Sylvain with wine-related questions – he’s an expert – they thought that there were probably a lot of other people out there with all the same kinds of questions. Together, they started thinking about how to help people discover and understand how wine works without overwhelming them with info, and after a few months, Sip & Learn’s concept was born! By subscribing, £30 per month plus £5 P&P, you’ll receive two carefully selected bottles of wine as well as an education booklet each month. Sylvain has tasted thousands of wines, so they promise that you’ll always get the best to be found in the price range, and they take pride in sourcing small producers that you won't find in your average store (yay!). Sip & Learn have a whole 12 month programme to follow; during the first 6 you’ll discover the 3 main elements that make a wine; the grape variety, the climate and the wine-making process. The following 6 will take you on a journey to deepen your understanding; specific regions, the influence of the terroir, developing your library of smell and educating your palate. You can sign up on a non-binding subscription, which rolls on unless you instruct otherwise (that means if you just want to receive a single box, no problem - cancel it before it renews), or you can buy 3, 6, or 12-month subscriptions up front. Sip & Learn have been very kind in sending me their first box to try out, so that I can tell you lovely lot all about it! Box #1 is all about whites; aromatic vs. non aromatic; sauvignon vs. chardonnay. The booklet starts with a little multiple choice quiz, testing what you already know about the two wines (I aced it – woohoo! ), and it also outlines what you’re going to learn. It’s pretty much all about taste - how to taste your vino, and how different grape varieties affect the taste. Sounds a bit basic, right? But this is the key to learning about wine, ignore this part and you’ll not get anywhere! 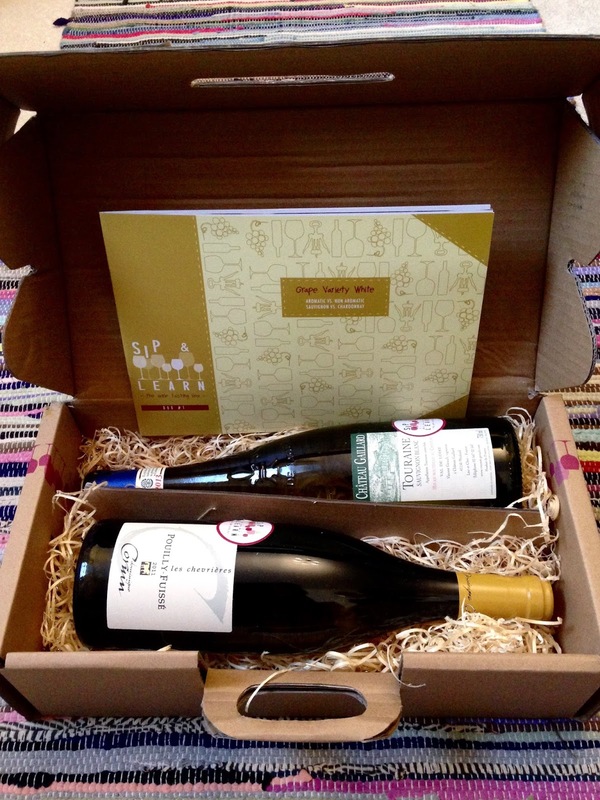 The two bottles included in the box are a zesty SAUVIGNON BLANC TOURAINE CHÂTEAU GAILLARD 2013, and a rich CHARDONNAY DOMAINE CORNIN POUILLY-FUISSÉ LES CHEVRIÈRES 2011. For each, a map shows you where the wines have come from, you’re told where the grape varieties are grown globally, and you’re given key facts about each style. The look/smell/taste of both are discussed – follow as you sip, writing notes in the booklet – and there are even suggestions of similar wines to try if you’re a fan. 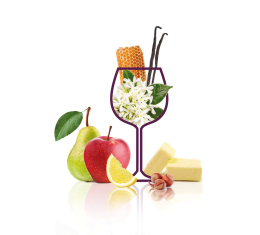 I particularly like the cleverly composed images illustrating the flavours you should be getting from your glass! 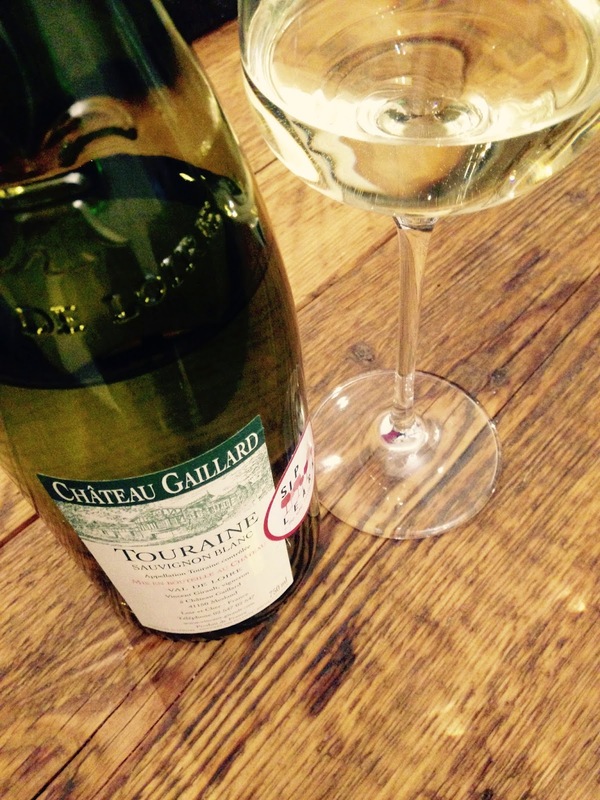 The Touraine Sauvignon Blanc has been picked because it shows the best of both worlds in terms of SB style; exotic fruit aromas combined with a distinctive vegetal character; so typical of the Loire Valley. Both wines have been given the French organic stamp, but this one is biodynamic too, which is explained without any confusion. AND there’s a fab food and wine pairing section that not only gives you a list of what you should be eating with your drink, but why you’ll find that it works. Sip & Learn have even provided special dish recommendations (you can get the recipes on their blog); asparagus, mint and lemon risotto with the Touraine Sav – yum! As for the Pouilly-Fuissé Chardonnay (goes with scallops BTW), we’re all probably aware that there are no shortages of great wines in Burgundy, but the reputation also comes with a hefty price tag. Because this one comes from an underrated southern part of the region, it offers that incredible complexity and balance whilst still remaining affordable (hence why it’s in the box). You learn more about the ‘layers of aromas’ that typically come with chards – fruits, butteriness, vanilla – and barrel fermentation and oak ageing is made clear too. 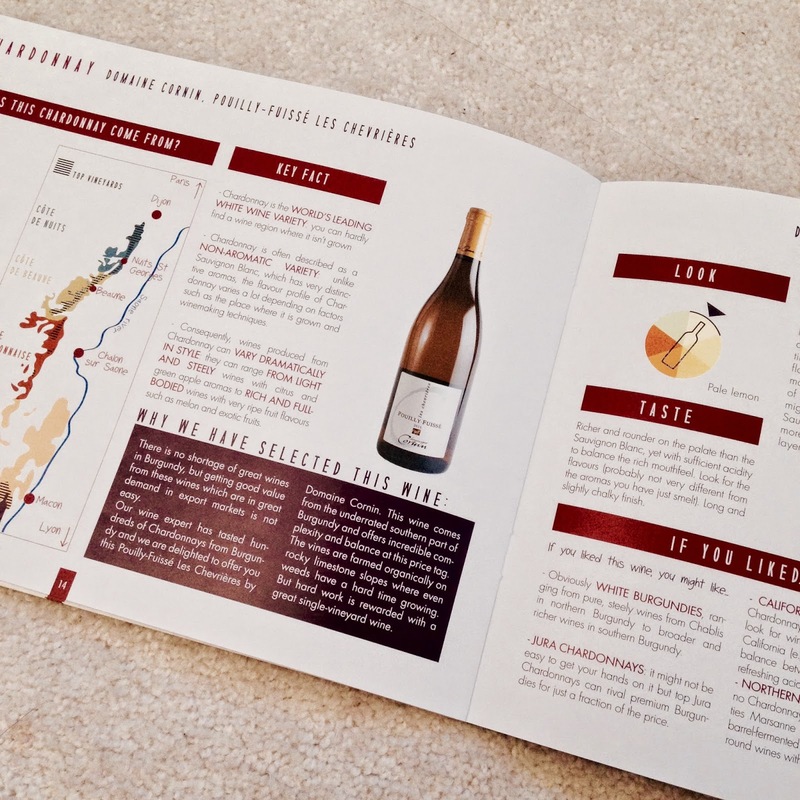 Once you’re done, you can recap with the handy chart at the back of the booklet – preferably with a glass of each in each hand! There’s a sneaky insight into what’ll be in the next box too; that’ll be sure to keep you subscribed, particularly if you hate missing out on things – *cough* me! Though I could happily have quaffed over these two bottles whilst getting my nose stuck into the booklet alone, I think it truly shines when it’s experienced with others. Simply stating what you’re seeing/smelling/tasting leads to discussion and, for me, that’s when I learn. That said, you could easily share your thoughts with Sip & Learn on Facebook and Twitter, and I’m sure you’ll get some response from friendly social media folk too. Overall, if you’re keen on educating your palate and gaining some knowledge in wine, then this is a sure-fire-hit, especially for those of you who can’t seem to find any local wine tasting events to go to! And if you find a wine that you REALLY love, fear not, all bottles are all available to purchase through the Sip & Learn website!